We talk with the star interrupter of The Interrupters. 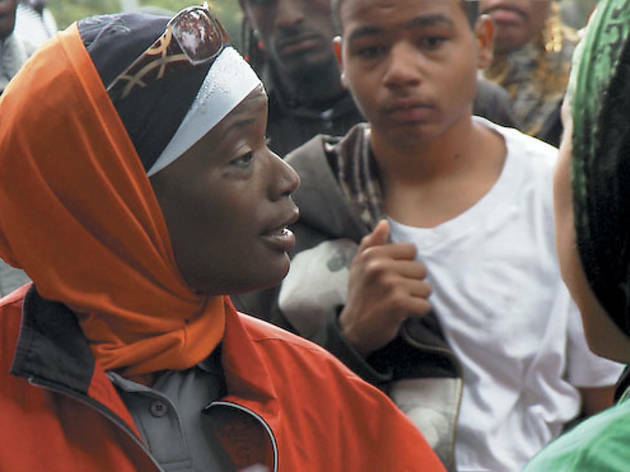 By now, CeaseFire violence interrupter Ameena Matthews is a star: “Chicagoan of the Year in Film,” according to the Tribune, and a highlight on a recent episode of The Colbert Report. When we first tried to speak with the Englewood resident in April about her role in Steve James and Alex Kotlowitz’s acclaimed Chicago documentary The Interrupters, she had to cancel—after hearing that a 12-year-old had been shot on the South Side. When you’re doing these violence mediations, if there’s a camera behind you, it’s very different. I call Steve and Alex and [co-producer] Zak Piper the stalkers, because once I did let them in, they were there, even if I invited them or not. They made it so comfortable to the point that you forgot that they were there. It was awkward, a little bit, when I dealt with the big groups, because they were trying to give me 100 percent of their attention. Then they’ll see the white film crew. Who are these guys? It got to the point that things were so heated, it was after the [filming] that they asked. You had to cancel your interview yesterday because a child was shot. He’s in stable condition. It didn’t hit any vital organs, thank God, but of course it wasn’t intended for him. That’s the life in the ghetto, man. If you sit in a room and you talk to some young kids and you ask them, How many people have heard gunshots?, the whole room will probably raise their hands. How many people have heard gunshots right outside of their home window? Pretty much everybody will raise their hand. How many people have lost someone to gun violence? Pretty much everybody’d raise their hand. How many kids here have been shot? Out of a room of 50, you may have 30. These kids [doing the shooting] are people, too. They’re not animals. If you sit with them, you would look at them and say, “You did what? Not you!” I’m talking about kids that want to be journalists. They just don’t know which avenue to take. They’ve never been downtown because of the safety issues—if they go across the street, they’re in another territory of gang violence and may get killed. It’s gonna take a miracle. We gotta do what we gotta do. An abridged 111-minute cut of The Interrupters plays on Frontline Tuesday 14 and will be streaming on pbs.org indefinitely. A new cut of the film will be available on DVD and Blu-ray that day.